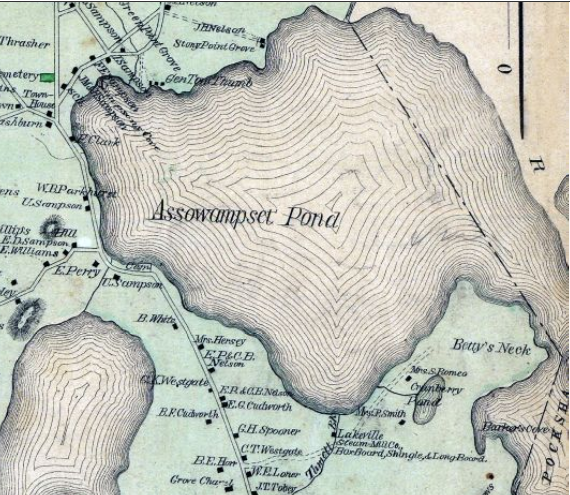 Assawompsett (place of the white stones) is a pond in Wampanoag territory, almost four square miles, presently within the towns of Lakeville and Middleborough, Massachusetts. Native tradition says that there were once two islands in Assawompsett, where currently there exist three large rocks in the water. One of these islands was called Manito Menis, a home of Pukwudjees, or the Little People. In more historical times, Assawompsett was the home of Tuspaquin (Wuttispaquin, the "Black Sachem"), the brother-in-law of Alexander, son of Massasoit. In 1662, John Sassamon, a Harvard-educated Praying Indian, had left Natick and moved to Nemasket, near Assawompsett, ministering to the local Wampanoag there. A former associate of King Philip, he soon fell into the sachem's disfavor. In 1675, his body was found under Assawompsett's ice. His murder became one of the causes of King Philip's War. The Assawompsett Christian Indian congregation Sassamon established was later served by the Native ministers Mr. Jocelin (1698-1711) and John Hiacoomes (1698-1718) together with the missionaries John Cotton, Jr. (1669-1697), Samuel Danforth (1689-1727), and Peter Thacher (1707-1744). By 1698, the congregation expanded to twenty houses with eighty individuals. In time, however, the membership eventually merged into the Indian church at Titicut. Benjamin Simons (d. 1836), a Wampanoag Revolutionary War pensioner, lived at the north side of the Assawompsett, on what was called Ben's Island. 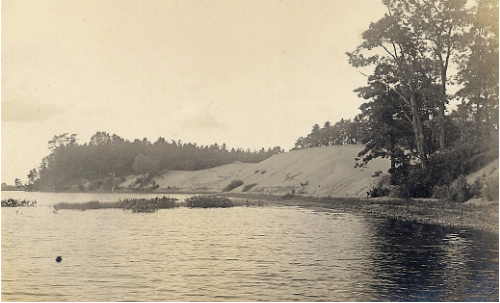 On the south side of Athe pond was Betty's Neck, an area where generations of Wampanoag continued to live. Betty's Neck, in particular, was the home of Lydia Tuspaquin and her family, descendants of the Black Sachem. Weston, History of the Town of Middleboro, 423-426. Silverman, Faith and Boundaries, 101-102. Staples, History of Lakeville, Massachusetts. Weis, The New England Company of 1649, 169. Image ("The White Banks, c. 1910"), courtesy of Recollecting Nemasket. Map taken from Lakeville Town, Plymouth County 1879, Massachusetts, Geo. H. Walker & Co.. pub. (1879).